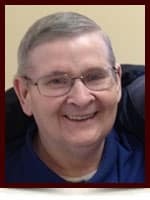 Albert Anton Latka - Edmonton's Burial & Cremation Professionals | Trinity Funeral Home Ltd.
Albert passed away peacefully on Wednesday, February 18, 2015 at the Robbins Pavilion at the age of 74. He is survived by his brothers, Edward, Walter (Elizabeth), Mike (Lorraine), George (Sandy) and sister Olga (Frank) Pasay, as well as numerous nieces and nephews. He was predeceased by his parents, Hazel and Andrew, brothers John, Victor, Elmer and sisters Annie (Art) Polachuk, Emma (Paul) Krisco and Mary (Francis) Starrs. In lieu of flowers memorial donations may be made to Christ the King Lutheran Church. We are sorry to hear about Uncle Albert’s passing & our sympathies go out to all the family members. He was always happy to see his nephews. Nephews Bill & Nick Polachuk. Calgary, Alberta. We were so sorry to hear of Albert’s passing, our condolences to all the family.